Eyes and Vision, An Eye Doctor's View: Corneal Topography, What is That? Dr. Andrew Neukirch takes time every quarter to explain what is new and noteworthy in the world of vision care, optometry, and optics. Corneal Topography, What is That? I would like to take this opportunity to briefly explain what Corneal Topography is and why your doctor may use this instrument. The cornea is the clear tissue at the very front of the eye. The cornea may be seen as you look at the iris; the colored part of the eye. This is the structure that a conventional contact lens sits on. 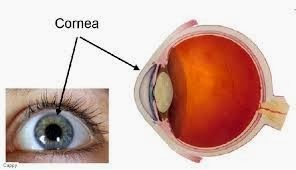 The shape of the cornea is responsible for determining a great amount of your eye’s refractive power, or prescription. Corneal Topography allows your doctor to measure and map out the exact shape of your cornea. Topography is not typically performed on most patients. An instance where it becomes helpful is when a doctor may see a very irregular spectacle or contact lens prescription and suspects that the patient may have an early form of a corneal degeneration. 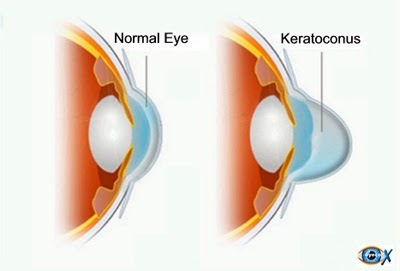 The most common corneal degenerative disease is Keratoconus, a condition where the cornea forms more of a cone-like shape than a gradual curve. Early detection is now paramount as there are now procedures offered that may stop this particular type of degeneration before it progresses. The instrument is also enormously helpful in fitting custom contact lenses or troubleshooting patients that are having difficulties with their present contacts. The immense amount of data provided allows your doctor the ability to design contact lenses that perfectly match the contours of your cornea providing the very best vision possible - better than any pair of conventional spectacles. The cornea maps also greatly reduce the chance that custom ordered rigid gas permeable (RGP), bitoric, bifocal, or progressive base curve contacts need to be adjusted or fine-tuned. Topography also plays a significant role in the evolving field of myopia control (keeping kids’ and teenagers’ near-sighted prescriptions from increasing). I will talk more about this in the upcoming months. Carillon Vision Care recently added a brand new Medmont E300 Topographer to our practice. This particular instrument is not only one of the most accurate topographers available, but its software interface provides beautiful visual cornea maps that are easily explained to the patient. We are very proud to offer this advanced technology to our patients that will benefit. Thank you for explaining what Corneal Topography is. I'm scheduled to see my Arizona eye doctor this weekend for a regular check-up. I'll inquire about Corneal Topography because I've been thinking for a while now to change my glasses to contact lenses. This would be my first time wearing contacts so I want to make sure that I can get the best option as possible.